Chemistry is the enabling science in a diverse cross-section of modern fields of research that range from fundamental to applied and includes catalysis, nanotechnology, renewable energy, materials and forensic chemistry. The Department of Chemistry at URI delivers the classic curriculum of a liberal arts education in chemistry at the undergraduate and graduate levels with an emphasis on the tools required of researchers in the most modern sectors of the field. An undergraduate degree in chemistry from URI provides students a foundation in all general areas of chemistry which prepares students for specialized research in academics or industry. Two undergraduate chemistry degrees are offered: the Bachelor of Arts in Chemistry and an American Chemical Society Certified Bachelor of Science in Chemistry (with an optional Forensic Chemistry track). At the core of any undergraduate degree in chemistry from URI is extensive research experience. Graduates from the Department of Chemistry have an excellent track record of transitioning to industrial employment or graduate school. Research is the heart of graduate education in chemistry. In the first year of their PhD studies, students will join a research group and begin performing experimentation at the leading edge of their disciplines. The Department of Chemistry is home to faculty in the traditional chemistry disciplines: analytical, inorganic, organic, and physical chemistry. Most research programs at URI are interdisciplinary, allowing students to become well-versed in multiple fields of study as they work to become leaders in their fields. With research ranging from macromolecules to nanoscience and fundamental to applied, URI Chemistry has a home for graduate students in any discipline. The state-of-the-art Richard E. Beaupre Center for Chemical and Forensic Sciences was occupied by the Chemistry Department in the summer of 2016. The four-floor, 133,000 square foot facility is energy efficient, earning a LEED (Leadership in Energy and Environmental Design) Gold rating, and serves both the teaching and research function for the Department. Levels one and two have three teaching classrooms with the latest multimedia capabilities. There are eight teaching labs for general chemistry, five organic chemistry labs, and one advanced labs used by upper level chemistry courses. Every student in the teaching labs works in ventilated space increasing the safety for every occupant. The building has 34 research laboratory modules assigned to faculty to pursue research. Research lab modules are designed using advanced safety equipment including low flow fume hoods, ventilated storage cabinets, and multiple snorkels. The Teknor-Apex laboratory houses shared research instrumentation, which is well-equipped owing to a generous matching program offered to the Chemistry Department by Shimadzu Corporation. Finally, the Beaupre Center has a number of meeting areas available for students led by the Chemistry Learning Center, where the Chemistry Department offers tutoring for introductory chemistry courses weekdays throughout each semester. The University of Rhode Island is located in Kingston, which is actually a post office address within the Town of South Kingstown. Kingston was originally known as “Little Rest”, because of its use by Colonial-era soldiers during the War of Independence. The village of Kingston retains much of its 18th century New England flavor, with many historic buildings dating back to the 1700s. The University is situated adjacent to the center of Kingston, and many of the activities in the area occur on university grounds. For example, the Ryan Center is a modern arena that hosts the URI basketball team, and provides the venue for concerts, comedy shows and other entertainment. Additional entertainment and nightlife are found in the nearby communities of Wakefield and Narragansett. The beach communities of Southern Rhode Island are within five miles of the University, and towns like Narragansett provides ample opportunity for swimming, sailing, scuba diving and fishing. Southern Rhode Island also offers unspoiled wilderness for hiking, canoeing and horseback riding. Because southern Rhode Island has a large resort community, one of its most active times socially and culturally is during the summer, when the University and the neighboring communities host theater, art workshops, festivals and fairs. Rhode Island also offers a variety of cultural activities year round. Providence has many museums and galleries, a symphony orchestra, and the renowned Trinity Square Repertory Company. Newport, a beautiful and celebrated seaside town, is noted for its superb restaurants, fine shops, and historical attractions, as well as its yearly series of concerts and plays. New York and Boston are easy day trips from the University. Both can be reached via Amtrak from the Kingston station, or by bus or car along Interstate 95. Cape Cod is about 50 miles northeast of Kingston. 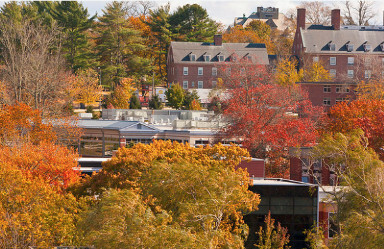 Within a half-day’s drive from campus are the New Hampshire White Mountains, the Green Mountains of Vermont, and the Berkshire hills in Massachusetts with their appeal of weekend hiking and ski trips.